This will be his first year at Seattle’s Moisture Festival. Mr. 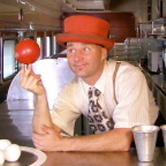 Spin is noted in the world of juggling performance for … wait, let me let Reg Bolton say it: “The legendary Mr. Spin from Adelaide, Australia draws us in to his show, where in 20 minutes of high octane silliness, we can lose sight of the pure skill and hard work behind say, the 2 full metal baseball bats, spinning like propeller devil sticks on one hand each.” We are all looking forward to this.